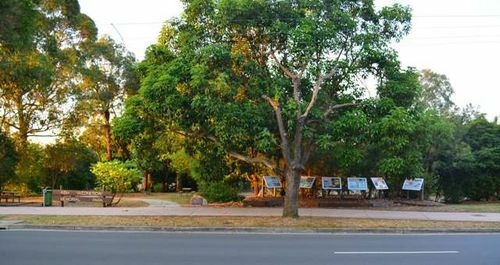 A park commemorates the people who lost their lives in the Ash Wednesday bushfires of February 1983. 21 lives and 186 homes and other buildings were lost in this community. On February 16, 1983, 75 people died when fires swept through communities in Victoria and South Australia. Thousands of homes and businesses were destroyed. For many of those who lost loved ones, life has been a struggle ever since. The town of Upper Beaconsfield, in the Dandenong Ranges near Melbourne, was one of the hardest hit. In near 40 degrees Celsius heat, strong winds whipped up a huge fire that surged through the tinder dry bushland to the west of the town. A dozen volunteer firefighters were among those killed. Their trucks were unable to protect them from the intense heat. 21 lives were lost at Upper Beaconsfield that night : 12 firefighters and nine residents. This park is a memorial to those who lost their lives as a result of the "Ash Wednesday" bushfires in Upper Beaconsfield 16 February 1983.